Insignia 10.2-inch portable DVD player features 10.2-inch TFT LCD display with widescreen aspect ration of 16:9, supports and plays DVD, DVD+R/+RW, DVD-R/-RW, CD, CD-R/RW, MP3 and Picture CD formats. The portable DVD player LCD swivel screen can rotate a full 180° for maximum viewing pleasure. Insignia IS-PDVD10, weighs 3.3 pounds and measures 10.25 x 8.75 x 1.25 inches. 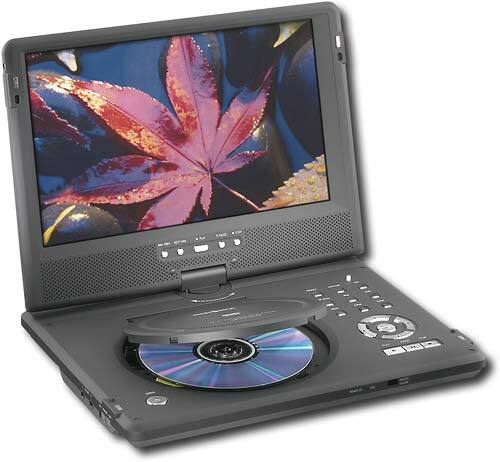 Newsfactor Magazine (dead link) reviews Insignia 10.2-inch portable DVD player and concludes with rating of 4.5 out of 5 that the IS-PDVD10 is an outstanding portable DVD player that provides excellent video quality on a large, 10.2-inch display, plus useful features such as an antishock system and swivel screen. Add plenty of battery life, and you have an excellent entertainment device for when you’re on the go.